Lucky me, with a generous neighbor whose back yard harbors an ancient, high-producing fig tree. It’s just about to come into the year’s second crop, so I’ve been searching out new ways to try figs. On the website of Napa Valley’s prolific Cosentino Winery I discovered a beaut: Grilled Rosemary Skewers of Black Mission Figs with Honey & Sherry. The site suggests pairing with a 2003 Semillon from Edie (a Cosentino brand). But at $48 for a split-size, that’s not a realistic choice for most of us. Semillon is a good idea, but also consider a Pinot Noir or a Sauternes. 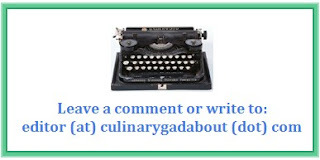 If you like this recipe, take a look at others by Cosentino. Over low heat, simmer sherry reduction ingredients for about 30 minutes, until reduced to a glaze consistency. Cut figs in half and place cut-side down on a flat surface. Skewer 2 figs on each rosemary twig, and brush with glaze. Grill over medium heat 2-3 minutes, flat side down. Remove from heat. Brush with additional glaze. To prepare fig leaf, lightly oil a leaf on the shiny side. 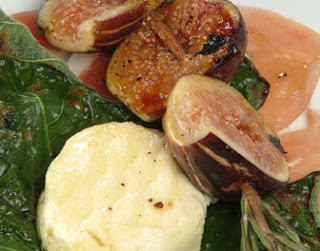 Place a piece of cabecou cheese on each fig leaf and grill over medium-low heat until cheese is warm and fig leaf is slightly wilted. To assemble, place 2 slices of prosciutto on the center of each plate. Set the fig leaf with the cheese on top of the prosciutto. Angle the skewer to the side of the cheese. Drizzle with more glaze on top and around the plate.